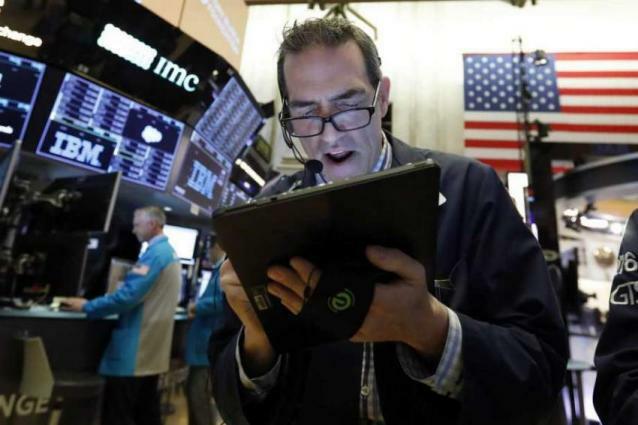 New York, (UrduPoint / Pakistan Point News - 17th Apr, 2019 ) :Wall Street stocks were mostly higher as trading opened Wednesday following better-than-expected Chinese economic data, although weak IBM results weighed on the Dow. About 15 minutes into trading, the Dow Jones Industrial Average was down 0.2 percent at 26,393.70. The broad-based S&P 500 gained 0.1 percent to 2,909.41, while the tech-rich Nasdaq Composite Index advanced 0.3 percent to 8,024.53. China's first-quarter growth came in at above expectations at 6.4 percent following government stimulus measures, a report that eases concerns about slowing global growth. In this holiday-shortened week, a trove of US companies reported earnings, with most seeing their shares rise following the results. Netflix gained 1.4 percent, United Continental 4.1 percent and PepsiCo 1.8 percent. But Dow member IBM sank 4.6 percent after first-quarter sales of $18.2 billion lagged analyst expectations. Qualcomm shot up 15.2 percent after the chip company reached an agreement in a long-standing dispute with Apple over royalties Qualcomm charges for its patented chips, which enable smartphones to connect to mobile networks. The deal includes a six-year license agreement with the option to extend for two years, and a payment to Qualcomm from Apple, the companies said. Apple rose 0.7 percent.